Finding the perfect style flooring for your next project is easy and enjoyable when you visit our flooring showroom. In addition to the hardwood, carpet, laminate, and vinyl options we provide, we carry a wide variety of designs for ceramic tile flooring that are made to match any décor. Come in to peruse our collection of such leading industry brands as Star Values and Floorcraft. Whether you’re looking to rejuvenate your current floor or interested in finding a floor for your new property, we help you find the exact style you have in mind. Our staff of flooring professionals is here to answer any questions you may have, and we’re dedicated to guiding you toward the perfect flooring solution for any room of your home or business. As part of our commitment to helping you find the best ceramic tiles for your commercial or residential project, our showroom features guaranteed low prices and the most reliable warranties available in the flooring industry. Our extensive buying power is made available through our affiliation with a national retail group, so you can depend on us for affordable prices on any flooring you purchase from us. Depending on the existing décor and the amount that you’re looking to spend, we recommend the style that we believe is the most suitable for your specific needs. With a broad selection of styles and colors available from some of the top brands in the flooring industry, the possibilities are nearly endless when it comes to finding the perfect ceramic floors for your property. Ceramic tile flooring is a solid investment in the overall value and lasting performance of your commercial or residential floor. In addition to offering a sense of timeless beauty to any room in which it is installed, the durability of ceramic tile makes it ideal for any area that receives extensive traffic on a daily basis. Tile’s resistance to moisture and stains makes it a popular option among those looking for a flooring option that will stand up to the demands of daily wear and tear. This makes it a common choice for any homeowner considering a new floor for kitchens or restrooms, but the versatile style of tile is suitable for virtually any flooring project. After we help you find the perfect ceramic tile flooring, installation is provided by our staff of experienced flooring technicians. Following a consultation to assist you in choosing the best option for your home or business, we prepare your flooring area for the upcoming installation process. We provide convenient service options for any ceramic tile flooring installation, to minimize any disruption to your daily schedule. You can be confident that the floor of your dreams will become a part of your life as swiftly as possible. When it comes to affordable floors that are designed to stand the test of time, look no further than our quality flooring showroom for your next project. 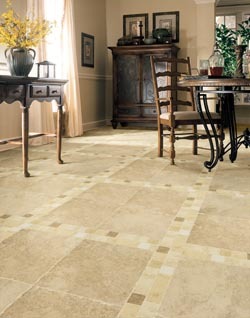 Contact us when you’re looking for ceramic tile flooring for your home or business. We proudly serve Allen, Plano, McKinney, Frisco, and Parker, Texas, plus the surrounding areas.